solve the radiative transfer equation. square errors between 25% and 30%. 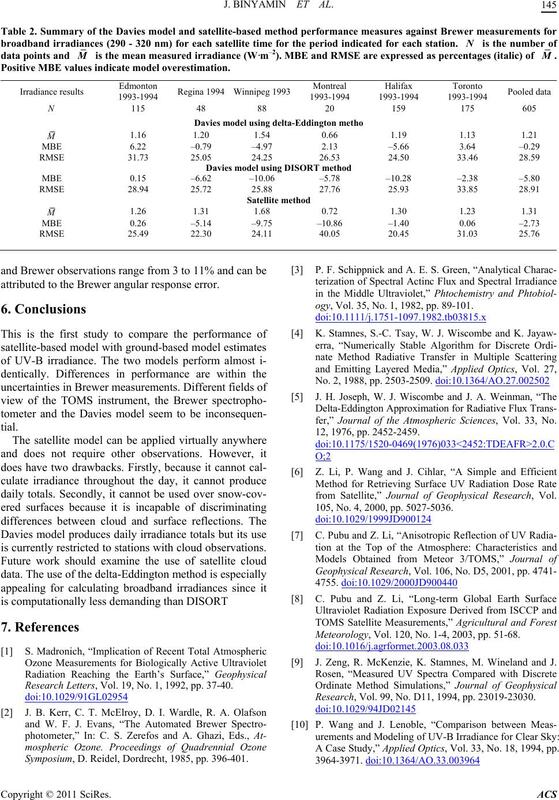 ble changes in ozone concentrations. for all sky conditions [13-17]. lite-based irradiances, are used in this study (Table 1). from sunrise to sunset at irregular times in GMT . TOA albedo at 360 nm and surface absorbed irradiance. tween May and September, with 605 data points in total. linear regressions constrained to pass through the origin. A different symbol represents data for each station. M is the mean measured irradiance (W·m–2). 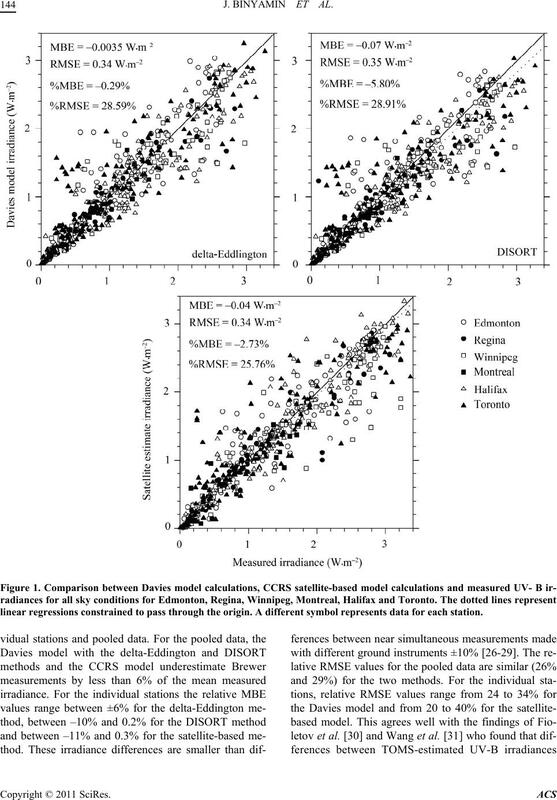 MBE and RMSE are expressed as percentages (italic) of M.
Positive MBE values indicate model overestimation. attributed to the Brewer angular response error. is currently restricted to stations with cloud observations. Research Letters, Vol. 19, No. 1, 1992, pp. 37-40. Symposium, D. Reidel, Dordrecht, 1985, pp. 396-401.
ogy, Vol. 35, No. 1, 1982, pp. 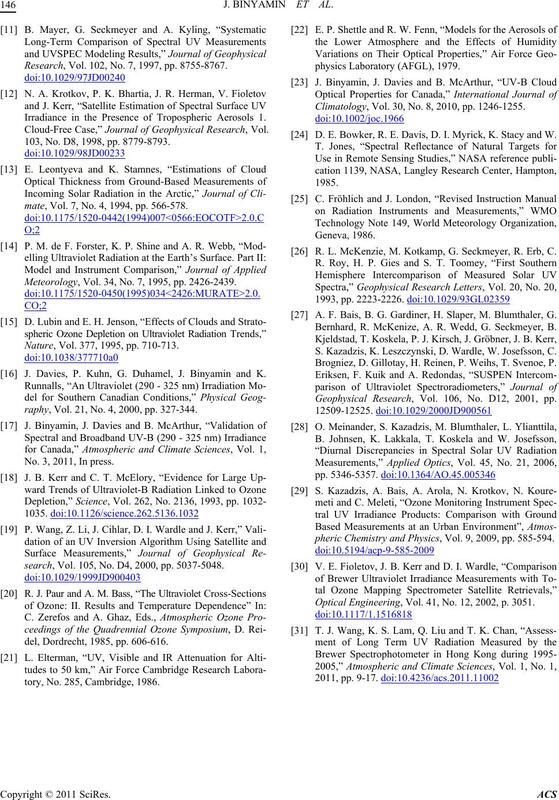 89-101.
fer,” Journal of the Atmospheric Sciences, Vol. 33, No. 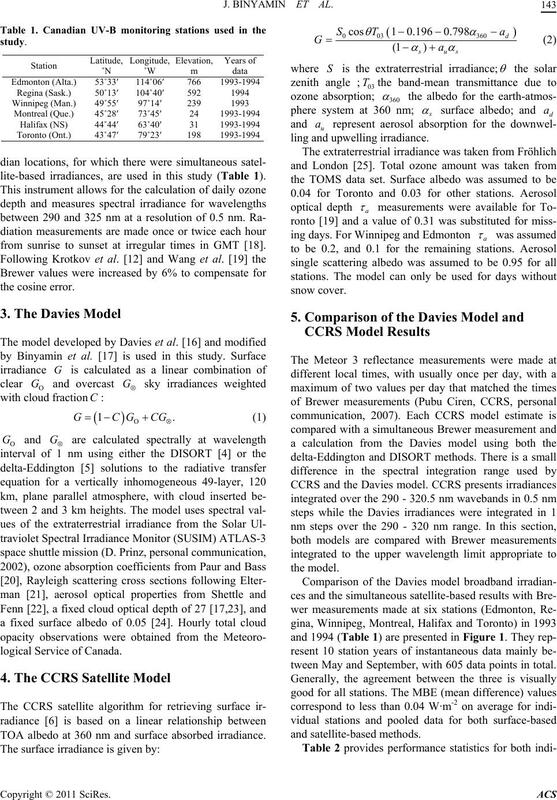 from Satellite,” Journal of Geophysical Research, Vol. 105, No. 4, 2000, pp. 5027-5036. Meteorology, Vol. 120, No. 1-4, 2003, pp. 51-68. Research, Vol. 102, No. 7, 1997, pp. 8755-8767. 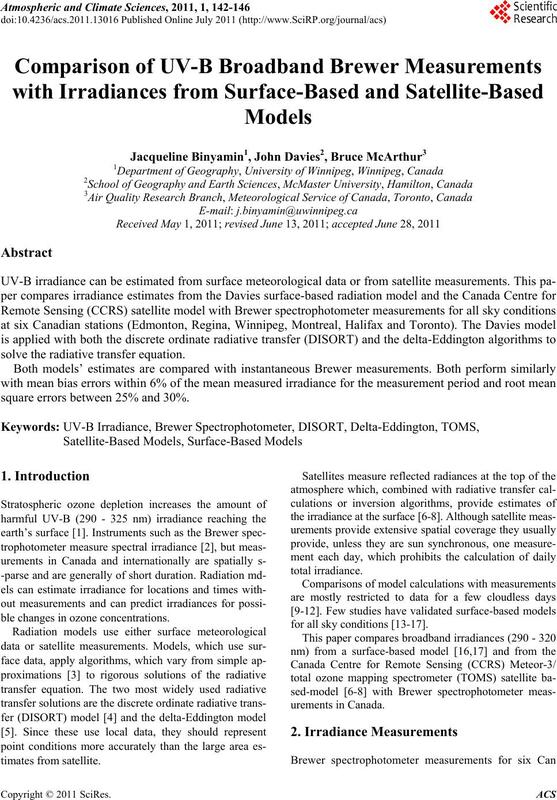 Irradiance in the Presence of Tropospheric Aerosols 1. Meteorology, Vol. 34, No. 7, 1995, pp. 2426-2439. Nature, Vol. 377, 1995, pp. 710-713.
raphy, Vol. 21, No. 4, 2000, pp. 327-344. No. 3, 2011, In press. del, Dordrecht, 1985, pp. 606-616.
tory, No. 285, Cambridge, 1986. Climatology, Vol. 30, No. 8, 2010, pp. 1246-1255. R. L. McKenzie, M. Kotkamp, G. Seckmeyer, R. Erb, C.
pheric Chemistry and Physics, Vol. 9, 2009, pp. 585-594. Optical Engineering, Vol. 41, No. 12, 2002, p. 3051.